INSTAPRINT started business in 1982 with one single monochrome press. Today it is one of the most efficient printing companies in the country thanks to a modern machinery, led by expert technicians. The chain of production is complete since the graphic design studio to delivery to the customer. 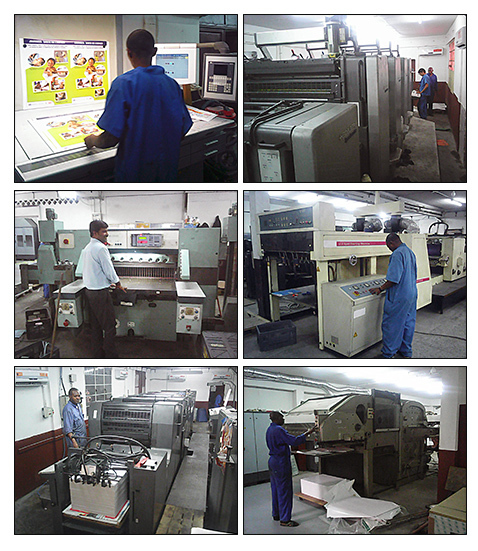 Prepress, press, postpress and shaping, everything is done from A to Z in the workshops of Kingabwa. INSTAPRINT has a new offset press last generation large format. The press HEIDELBERG CD 102 is equipped with all the modern automation tools and systems. Connected to multiple CTP, this machine can meet the most stringent quality requirements at an impressive speed.